Today is a statutory holiday in many parts of the world, so I got to sleep in this morning after many crazy days in a row. We're getting ready to head to Bolivia for the World People's Conference on Climate Change and the Rights of Mother Earth. (It was originally the People's World Conference on Climate Change and Mother Earth's Rights, but try saying that five times quickly!) It's a long way to go for people who are concerned about greenhouse gases, but every now and then we have to weigh the benefits against the costs. I've already spoken with some environmental organizations in Bolivia, especially the host city of Cochabamba, to encourage them to offer us visitors some "carbon offsets" as a fundraising strategy for them. 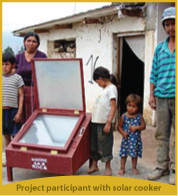 The CEDESOL Foundation, for example, travels throughout the countryside to teach rural people how to use solar cookers instead of wood and gas as fuels. They have also extended their projects into poor urban communities. Encouraging these people to use these environmentally friendly solar cookers is a win-win-win (sustainable development style), as traditional woodstoves cause terrible respiratory health problems, and gas is expensive. I know I plan to donate money to this forward-thinking NGO when I reach Bolivia.